I have been a bridesmaid a good amount of times. I have been lucky. All of my friends tried hard to pick a dress that was affordable, pretty, flattering on several different body types, and one that maybe...just maybe...could be worn again. I never took their time and considerations on BD much to heart. Then it was my turn to find a dress that was affordable, pretty, flattering on 8 different body types and that could potentially be worn again. First my Mom and I scoured wedding dress stores for possible options. Nothing. Then we went the regular store route (Nordstroms, Dillards, Ann Taylor). Zilch. Scoured online website. Negative. I even thought about renting dresses from Rent-the-Runway! However, no matter what I did, it felt like a never ending battle. I wanted the perfect dress for everyone! All along I said no matter what I WOULD NOT pick a dress from J Crew. It was a matter of principle. I felt like they were too expensive and that everyone has used them. It was a cool day in March. We were less than 6 months out. Still no bridesmaid dress. I was checking my email and one was from J Crew. They were having a sale on wedding attire. They only have that sale for one week every year. I saw a dress I liked. The sale made it even better. I sent it to a few of my bridesmaids for approval and they liked it too. 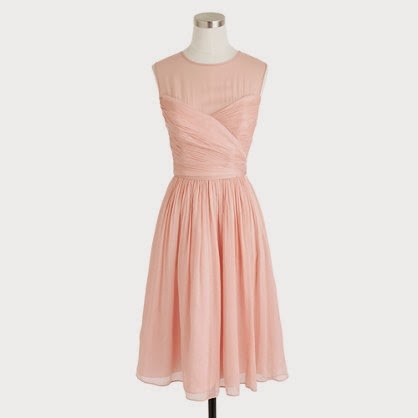 At that moment I went back on my word and selected a J Crew Bridesmaid Dress, and I could not have been happier. I am not sure if any of them will ever wear it again (in fact, I know Beth won't because she danced it into shreds haha), but I know they all looked gorgeous in it! What did you think is the hardest part when planning a wedding? That poor dress. I loved it! RIP. You looked beautiful in it! So difficult picking a BD!!! I think another difficult task is the guest list. Of course you want EVERYONE there, but not EVERYONE will fit in the venue nor do many couples have an unlimited budget to afford having an enormous guest list. Yes! I agree. Guest List was so hard as well. When that portion was finished I felt so much relief! Jessica's Comment: I'm still early in the planning stage and so I'm not sure I've come to the hardest part yet. I am nervous about picking dresses because I really want to have them all in one dress but I have some very different body types in my bridal party. I'm sure when I get to that point it will be a tough one! My Response: That is how I was. I wanted everyone to match but also feel good and look good. The dress I picked had an a-line skirt, and I think that was one of the reasons it was so flattering on everyone! Good luck with planning and congratulations! The preview of your photos is so beautiful it brought tears to my eyes! You are stunning, my friend, and it's wonderful to see how happy you were on your special day! I'm so so so very happy for you two and I can't wait to see everything else you have in store to share!!! Thank you Mary!!! It really was such a great day, and I cried when I watched it too. I am so emotional still!!! But again, that is me, the cry at everything girl. One of my fears the whole time was that one girl might have ordered the wrong color dress. Like you, I didn't see them on anyone in person until the day of the wedding, but it all worked out perfectly. I loved Andrew's guest post on the blog!! !